Earlier this week when I was cleaning I noticed a large green roll of bags in my cleaning closet. I’ve seen it there before but really never payed attention but this time around I took it out and looked at it. Turned out it was small plastic bags for “left over” food. My first thought was “oh do I need to do that”, next “why didn’t the reservation desk inform me when I moved in 6 months ago” (sidetrack: Wow I’ve lived here that long!) and lastly “I wonder where I should throw it”. 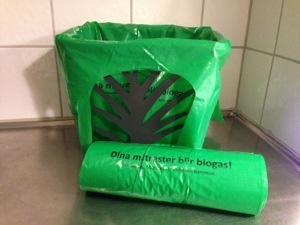 They have similar types of collecting food garbage at other places in Sweden too. The other type I’m familiar with (from my parents as well as relatives) is using small paper bags which means they get wet and basically collapses before you have the time to throw it away. You also need to throw it away in special bins which a lot of the time means extra work. Having a special type of plastic bag which you can throw away with the normal garbage is so much easier for everyone. One big PLUS point to Linköping. What happens with the green bags of food after they get sorted out? They turn it into biogas.